It all started with a mysterious and seemingly innocent postcard, but from that point nothing was to remain the same in the life of Griffin Moss, a quiet, solitary artist living in London. His logical, methodical world was suddenly turned upside down by a strangely exotic woman living on a tropical island thousands of miles away. Who is Sabine? How can she "see" what Griff It all started with a mysterious and seemingly innocent postcard, but from that point nothing was to remain the same in the life of Griffin Moss, a quiet, solitary artist living in London. His logical, methodical world was suddenly turned upside down by a strangely exotic woman living on a tropical island thousands of miles away. Who is Sabine? How can she "see" what Griffin is painting when they have never met? Is she a long-lost twin? A clairvoyant? Or a malevolent angel? Are we witnessing the flowering of a magical relationship or a descent into madness? This stunning visual novel unfolds in a series of postcards and letters, all brilliantly illustrated with whimsical designs, bizarre creatures, and darkly imagined landscapes. 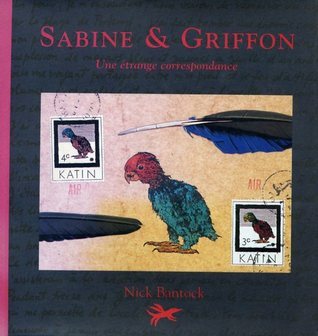 Inside the book, Griffin and Sabine's letters are to be found nestling in their envelopes, permitting the reader to examine the intimate correspondence of these inexplicably linked strangers. This truly innovative novel combines a strangely fascinating story with lush artwork in an altogether original format.